Welcome, newly credentialed practitioner! Use the following resources to guide you through the recertification and maintenance of your credential. In order to retain your credential, you need to pay a yearly, registration maintenance fee. You will receive your first fee notice within a week of passing your exam. Subsequent fees are billed every June with a August 31st due date. Academy of Nutrition and Dietetics membership and their dues are separate and distinct from registration with CDR. 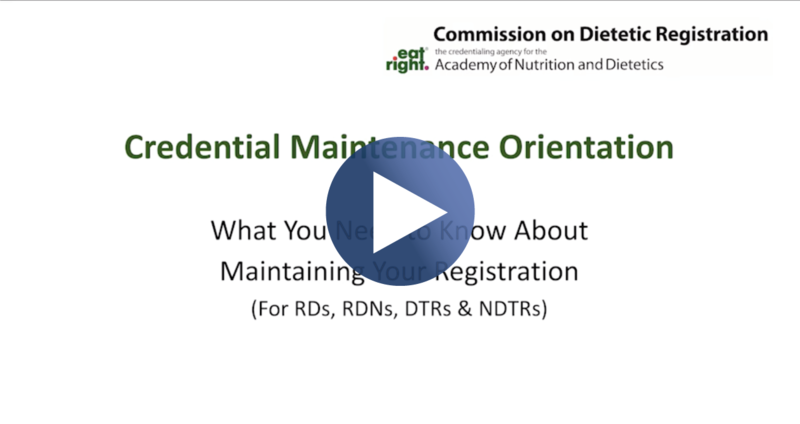 All RDs and DTRs must complete continuing education in order to maintain their credential. RDs need 75 credits and DTRs need 50 credits in their 5 year cycle (1 credit must be in ethics.) The Professional Development Portfolio (PDP), is designed to assist credentialed practitioners in planning for their professional development. MyCDR is your personal landing page for managing your credential. You may update any of your personal information on this page aside from your name (name changes must be made using the Name Change Form). Find resources to assist you in completing your PDP, determine if you need licensure in your state to practice, and learn how to verifying your credential online. How do I find CPE resources? How do I verify my credential online? How do I become licensed in my state? How do I become a member of the Academy? How do I volunteer to become an item writer?